Less than 60 squidgies for an AM3 muffboard? You're paving a taugh! As you can see, my command of cockney rhyming slang is slightly lacking.Note to self: don't do that again. 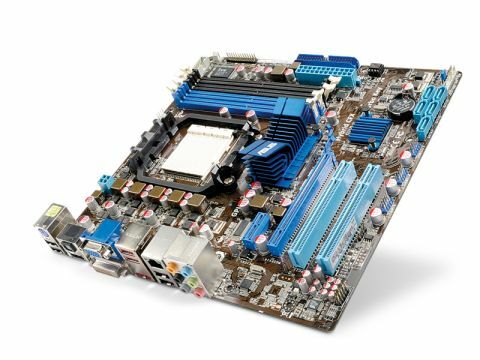 The Asus M4A785D-M Pro motherboard is of the Micro ATX variety, so it's great for wee little media (or meeja) centre PCs. It's also got that whole AMD backwards and forwards compatibility thing going on, so you can potentially build a PC for very few pennies. Or jennies. The single PCI-e form factor negates any CrossFire or SLI action, but you can fire it up in hybrid SLI mode, which means that graphical data is shared between your graphics card, and the onboard GPU. Clever stuff, but it didn't make a huge difference to performance. The motherboard's also got the full roster of HDMI, VGA and DVI ports meaning you could almost forget about a graphics card and install the manboob in a really slim case, if you want. If you do want to install a card, though, Asus has included a feature where you can overclock your pixel-pushing powerhouse from the BIOS. We had no luck getting it to work. It requires you to input an arbitrary number between one and 1,500, which is said to overclock the card. But it didn't increase our frame rates at all. As with Asus' other boards, it's easy to overclock the CPU, and it comes with the SplashTop instant-on OS. It's perfect for a slightly gamey media centre PC, but we wouldn't want it in a proper gaming desktop. At this price, though, it's a really good investment.